A long tiring day. We were awake about 4:00 AM—raccoons outside the window trying to get open the garbage cans. Debbie was awake too. Finally we had to give her the morning bottle; I was awake, so studied German from 5:30–6:30. Sleepy, went back to bed, did get some sleep until 9:00 AM, got breakfast; felt lousy. A very slow morning. Finally got to German, but I was still suffering from loss of sleep and ran into difficult German. After lunch and more work on German, Bonnie + I went out in the sail boat with Paul + Marty; went swimming—had a grand time. Back about 5:00; Grandma took us all out to eat. When we got back, Paul wanted to water-ski, we went along, but only he skied. We got back to the house about 9:30. Visited; I study [sic] more on German; bathed; off to bed; lights out 11:15. Up about 8:00; after breakfast set to work on German—Bonnie went to waterski with others. I tried to spend most of the day on German. But it was uncomfortably warm today and I ran into some very troublesome passages—so progress was slow. After lunch I kept working until about 2:30. Went to the beach to photography [sic] Debby with Marty + Bonnie. Came back to the house and worked on German until about 3:30. Marty, Paul, + I then went across the lake (sailed) to the swimming place took pictures—Bonnie went with Mrs. Stoner + Debbie to the beach again. We were home by about 5:45. After supper returned to German while Bonnie + Paul went to waterski. Watched CBS news 7:00-7:30. Studied rest of the evening with many interruptions; finally bathed after 11:00. Then spent a little more time on German; OBLO, 11:45. Was up about 8:00; went to work on German after breakfast. Wasn’t feeling too hot—went back to bed for a few minutes. After getting up again, returned to German. About 11:00 I stopped to shave, eat lunch, pack our things into Paul’s car. They returned from sailing about 12:30—and within a half hour we left for Schnectady. Bonnie, Debbie, + I dozed on the way. Not too long after arriving I got to work on German again. Then when Paul got the van, we started loading Paul + Marty’s things into it from the garage. When we had it filled we stopped for supper + to watch the news. Then we went to their house; after unloading went to look at a refrigerator. Returned home, reloaded, back to the house again—Bonnie came too—Debbie left with Marty’s brother Bob. Home again snack, bathed off to bed 12:15. Couldn’t get sleep—Debbie groaning and lousy bed; at 12:45 went downstairs—slept most of the night on the couch. In the morning after breakfast helped Paul load the van again. Then stayed home with Debbie while Paul, Marty + Debbie [sic; should read Bonnie] went to the house. Slept some in the meanwhile—late in morning went to grocery; at 12:30 fed Debbie. Was eating my lunch when others returned about 2:00. By three they had returned; I stayed with Debbie—at 4 o’clock watched Apollo 11 telecast from moon orbit. Then fixed supper for the group. They returned by 6:00. We had supper. By about 7:00 we got on the road for return to Silver Bay. We got here about 9:00; sat around chatting until about 10:15. Debbie enjoyed herself playing in the living room; off to bed—LO c. 10:45. A long, exciting day. Up about 8:30. After breakfast, I got to work on German—took a photo of Paul with Debbie on his back. Just before 11:00 turned on the TV for moon coverage. Kept pretty close to the TV all day—did get a few German sentences done—but paid attention mostly to the TV. Had a brief lunch—but watched TV closely from then on. A very exciting moment as the spacecraft neared landing—and set down—at 4:17:40 EDT. We had supper, after learning that the walk on the moon was advanced several hours. Stayed at the TV all evening. About 10:00 Armstrong + Aldrin began moon walk. The TV pictures from the moon were amazing. We could clearly observe the maneuvers and wanderings of the astronauts. Of course saw Nixon’s call to the astronauts; finally tore myself away from the TV about 2:30; OBLO 2:40. 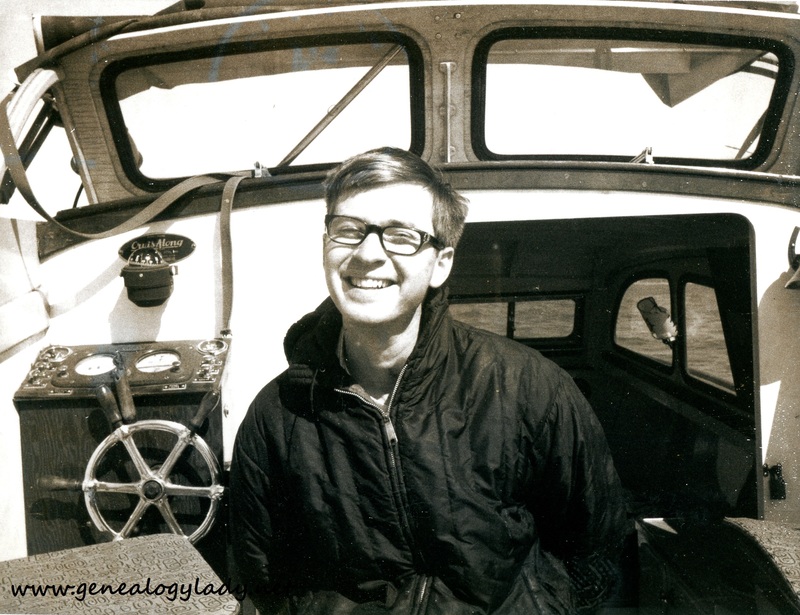 This entry was posted in Genealogy, Yegerlehner and tagged 1960s, David A. Yegerlehner, Deborah Yegerlehner, genealogy, sailing on June 17, 2017 by Deborah Sweeney. “held Debbie in my lap for her to see the rocket take off” I definitely do remember doing that! Nice to see a bit of thrilling history included here!